Beautiful Recording King Songster 5 String Resonator Banjo. Mahogany Resonator, Mahogany Neck, Rolled Brass Tone Ring, Nickel Plated Flange, Bound Rosewood Fretboard, Kershner Style Tailpiece, Nickel Plated Hardware, 24 Brackets, Diamond Fretboard Inlay. 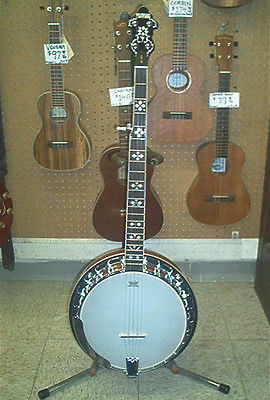 Great Sounding, Great Playing Banjo at an Unbelievable Price.